Written by CFC staff Dena Razapoor and Rachel Baitz, Programs Coordinator and Assistant, respectively. CFC and DHX recently teamed up to host a bootcamp for 25 CFC alumni on writing for animation, where participants learned from Cloudy With a Chance of Meatballs series creators Mark Evestaff and Alex Galatis as they deconstructed their creative process on this Saturn Award-nominated series. Writers who want to work in animated comedies need to love animated comedies. This means watching animated series that they love, and also those they … love less. Animated comedies are often required to create episodes that have some serious genre tropes, such as a Christmas special, a Halloween episode, and the all-too-familiar birthday episode. Get inspired in your own writing by watching how other series approach these specials without falling into clichés – which requires a creative approach to the characters and their flaws, personalities and desires. A premise is a simple idea, which lays out a beginning, middle, and end. The intention behind a premise is to sell the story, while being short, simple and communicative. The premise should match the characters and the format of the show, but should also be unique and imaginative. The strongest animated comedy series are funny and entertaining because they marry clever dialogue with visual onscreen gags in new and creative ways. 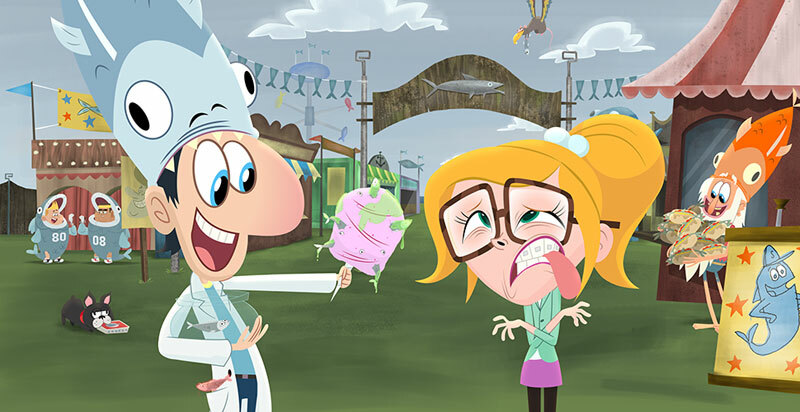 Several animated series, including Cloudy With a Chance of Meatballs, have 11-minute episodes, which require shorter scripts that ultimately result in a cleaner story plot and structure, as they do not require a B plot. However, writers should be careful not to fall into the mindset that a shorter script means they have to choose a theme and try to find a story to fit that theme – i.e. don’t try to write a friendship plot because this is the friendship episode. Instead, writers should focus on finding the funny nugget, and turn that into a friendship story – the resulting episode will be full of heart and stay true to the show. Over time, 11-minute episodes have evolved from ‘premise, gag, gag, gag, oops-we-ran-out-of-time’ to the now-familiar comedy rhythm of ‘premise, gag, gag, twist, gag, gag, end.’ Twists can be anything from a secondary character introducing a new concept or a change in perspective from the protagonist. Do not force unoriginal ideas, lines or physical gags that do not propel the story forward, or are otherwise out-of-character – comedy needs to be consistent and familiar to the show and its audience. Evestaff and Galatis swear by “the funny nugget,” which boils down to something so funny – an idea so hilarious – that you can easily riff a hundred ideas off of the one nugget. However, the nugget cannot just be generally funny, it must tie into the characters’ emotions and desires, staying true to the show and the audience. A strong story with comedic elements is better than a weak story with an excess of gags and parodies. The best comedy is a result of story and character; from there, insert layers of problems and challenges to create tension, add a surprising twist to an otherwise classic idea, or juxtapose opposing personalities. In comedy, characters should be defined by their negative qualities because it makes for interesting and funny television, whereas perfect characters are boring to watch. When establishing the characters’ positive qualities, frame them within their negative qualities, so that the characters succeed despite their problems. As a result, the audience cares about the character and roots for them, even though they are flawed. Animated series are a collaboration between the writers and artists. However, the artists aren’t privy to the writers’ conversations – so, if the writers are introducing a new world, character, or item, they should remember not to imagine something that would be very difficult to put into art. Thank you to DHX – especially Stephanie Betts, Senior Vice President, Development and Current Series, DHX Media; Hila Sharif, Development Manager, DHX Media; Carly DeNure, Script Coordinator, DHX Media; and, of course, to Mark and Alex for this informative and insightful bootcamp.